As we move our organisation to in-house digital and IT development and support, we’re up against stiff opposition from other government departments and the private sector to recruit the talent we need. In my experience, graduate recruitment is one of the best ways to develop new talent. So we took him at his word, and recently ran our first digital graduate recruitment campaign. With all the competition out there, we needed to make ourselves stand out from the crowd. Here’s what we’ve learned from the experience so far. Our first task was to find out how graduate applicants like to interact. We knew that the days of advertising in the broadsheets was gone. Graduates these days expect instant responses to their questions and applications, and working within the Civil Service constraints and systems can make this a challenge. Our solution was to use social media to get our message out and to interact with potential applicants. This approach is still developing, and we intend to start using more platforms. As our new graduates come on board, we’ll find out more about their experiences and improve our approach. You can shatter perceptions of the drab corridors of Civil Service if you bring applicants to an open day. We held our first open day on 1 November 2016. We worked with Kainos, our digital vendors, to design and deliver the event. The applicants spent time with different members of our agile teams. We took them on the journey from an initial idea to making it a reality in the live service. It was great to see all applicants so engaged throughout. We showed them the MOT testing service, which is, according to the Government Digital Service, one of the best digital services in government today. The applicants saw exactly what they would be letting themselves in for, and our plans for our digital academy and their first year in post. As with all these things, we over ran. We thought the applicants would be out the door as soon as they could. But they didn’t want to leave! Their enthusiasm for DVSA, and our Digital Services and Technology directorate in particular, was great to see. I’m pleased to say that all of the candidates got through to the next stage. Our campaign was very well organised. It was a great joint effort between our Digital and People teams and Kainos. Clear communication and regular contact between teams was a major factor in the success of our first event. We used a quick and simple way to capture feedback. 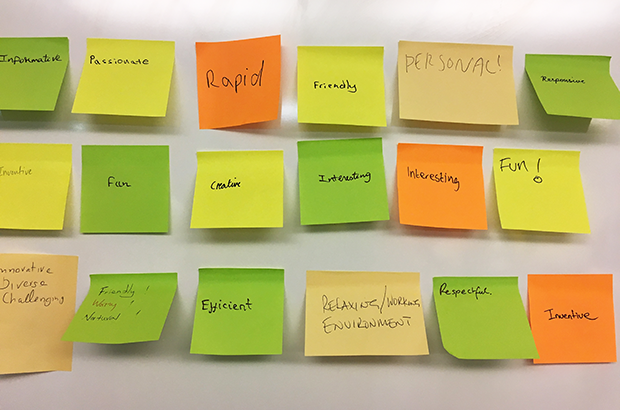 We asked each of the applicants to pick one word to describe their view of DVSA at the end of the day. 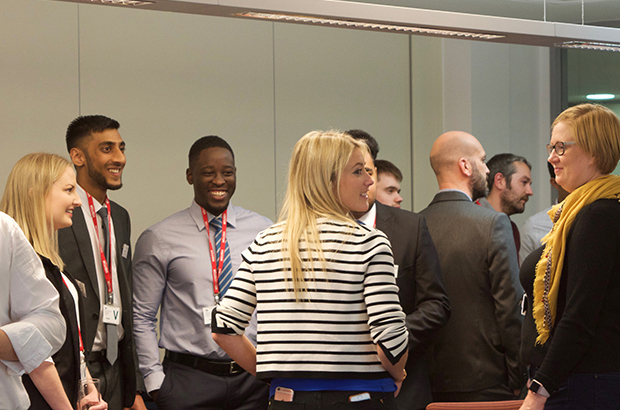 It was great to see the positive words and sheer excitement that the event had brought out from our applicants. Our initial sift of applicants produced a strong batch of applicants for our open day. All of them will now go through to interview later in November. I wish them all well, and hope that I’ll see them all again very soon! We’ve made a short video to show you more about the day and what some of the applicants thought. We’d love to hear about the challenges you face when trying to recruit digital talent into your organisation, and what steps you’ve taken to address them. What methods have you used, and which have been most successful? Let us know in the comments. DVSA is on a technology journey. We’re coming to the end of some major outsourced contracts, which have served the agency well. But now as we come to the end of them, we’re taking more control of our technology moving forwards. So take the national MOT service for example. That was outsourced fully until last year. But we built the capability to run that internally ourselves, using a combination of civil servants, contractors and vendors. We now improve that service every week with our own releases. And moving forwards, we’ll be doing that for other services as well, and trying to build our capability of digital expertise is going to be part of that journey. It seems like a nice working environment, everyone seems friendly. How the teams all work together - they all talk together, share ideas and everything. I like that. A great place to work, look around, it’s very illuminated, it’s like you’d want to work here. It’s like great people, all these great minds, very diverse minds, diverse backgrounds. I think it would be… it would be a good opportunity for me to work here, and I hope I’ll be a good asset to DVSA. The kind of layout of this scheme looks very attractive to me, so that I can learn what I actually like doing, and what I’d like to specialise in. With DVSA’s purpose being helping you stay safe on Britain’s roads, I hope the applicants have got a really good understanding of what we do, and what they can do to be part of our digital journey, and have a great career not only with us, but with the Civil Service.